· Vice President, Institute of Smart materials, Structures and Systems (ISSS). 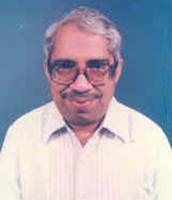 · Member(1985-93), Co-ordinator (1993-2000) , Aeronautics R&D Board, Structures Panel. · Indian Representative, Executive Council of International Congress of Fracture (ICF) (1984-89). · Guest Editor for three Special Issues of the Journal on Fracture Mechanics, published in honour of Prof. G.R. Irwin. · Member, Working Group for Development of Fracture Control Plan on PSLV Programs, VSSC, Trivandrum. · Member, Task team for Fracture Criterion in Design of Pressure Vessels/Rocket Motor Casings formed between VSSC, Trivandrum; NAL, Bangalore; and IISc, Bangalore. · Member, Mission Advisory Committee, Advanced composites Mission, DST, New Delhi. · Senior Associate, National Institute for Advanced Studies (NIAS), Bangalore. Theory of Elasticity, Aircraft Structures, Aging structures, Life extension methods, Fracture Mechanics, Finite Element Methods (linear and non-linear), Composites, Smart structures, Aircraft and Missile Design, Experimental Stress Analysis and Non-destructive Testing. · ARDB Silver Jubilee award for best sponsored research project, 1996. Published over 162 papers in Journals and Conference Proceedings.